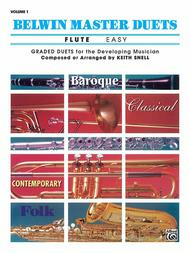 A proven source of graded duets for both the student and teacher of brass and woodwind instruments. Each volume contains works from the Renaissance, Baroque and Classical periods, folk songs and traditional tunes, and a selection of original compositions by Keith Snell in a variety of styles. A useful source of repertoire. Contains: Adagio (Mozart) * Allegretto (Haydn) * Bouree (Telemann) * Concert Duet in Three Movements (Snell) * Dance (Snell) * Daniel Cowper (English Country Dance) * English Folk Tune (Traditional) * The Hunters of Kentucky (American Traditional) * Intrada (Graupner) * Legend (Snell) * March (Anonymous) * Minuet in G (Bach) * The Music Box (Snell) * Norwegian Folk Song (Traditional) * Red River Valley (American Traditional) * Scottish Folk Song (Traditional) * Sea Shanty (American Traditional) * Serenade (Turk) * Three German Dances (Haydn).